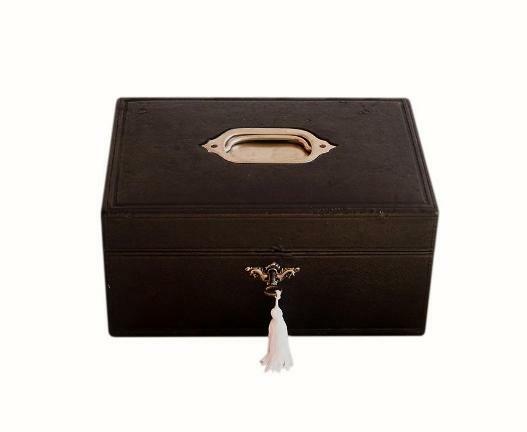 This is a superb antique leather finished vanity, sewing and jewellery box. 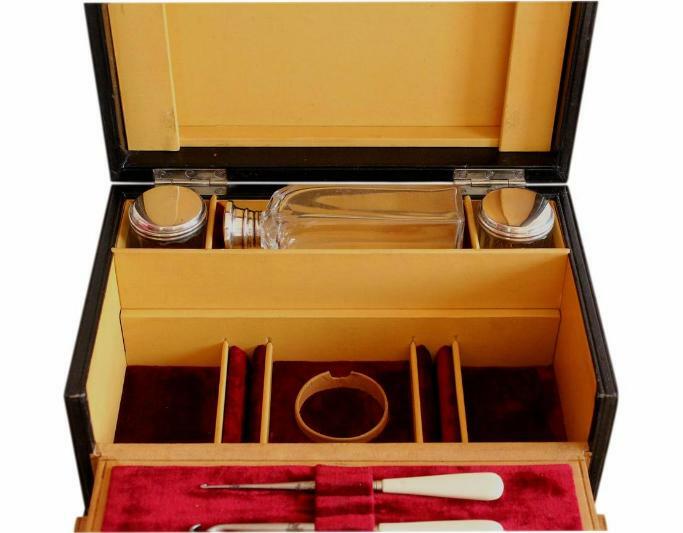 It comes with a collection of antique bottles, jars and sewing implements, and has several compartments for storing jewellery. Further details below. The box is late Victorian or early Edwardian. 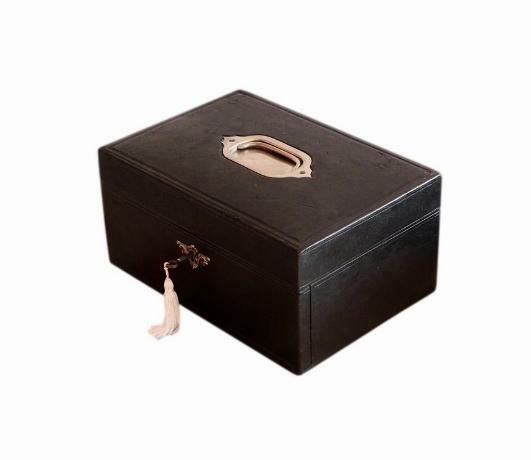 This box has a wonderful black leather finish. The lid has its original white metal swing handle and plate, and the box has its original 'stop' hinges. These prevent the lid from falling back. The box has its original working lock and comes with a period key. There is a beautiful ornate raised white metal escutcheon to the keyhole. This is a replacement which is in keeping to what the original would've been like. The front of the box drops down when the box is unlocked, revealing the front section of the interior which pulls out. The front top section of the interior has a wonderful two layered design which unfolds. You pull this forward and it extends in front of the box. The back part of this section has its original red velvet pad with slots. There is an antique crochet hook and tatting tool present here. There would have originally been 5 sewing implements here. The vacant slots can be used as desired. The front part of this section has 3 compartments. 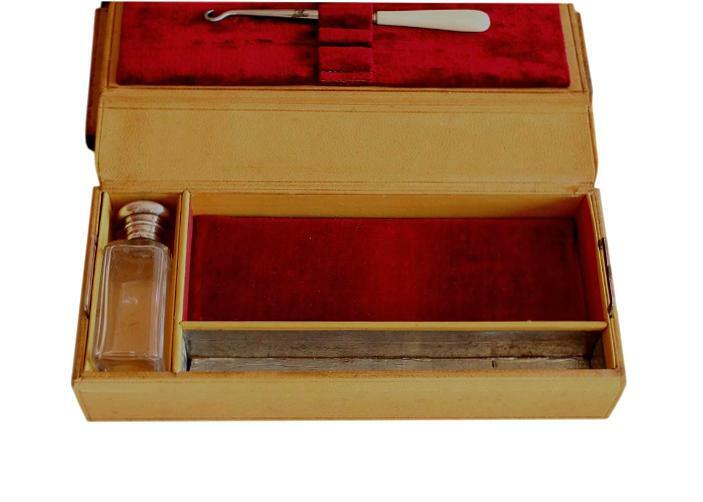 The left narrow compartment is holding an antique bottle with a silver plated lid. This is very nicely cut and shaped, and can be used to hold perfume or a lotion etc. The rear right compartment has its original red velvet padded panel. This is for jewellery storage. The front right narrow compartment has its original silver foil linings. This would have originally held a brush of some type. 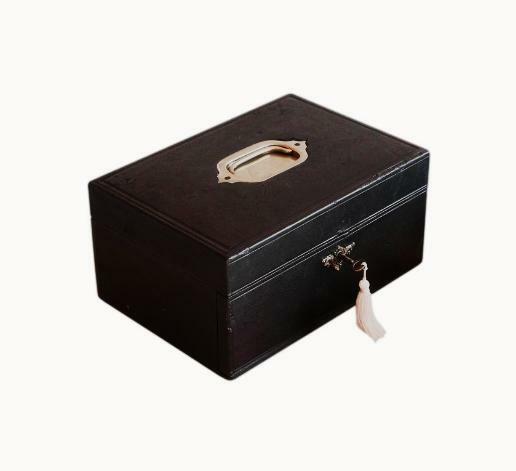 It will now be very useful for storing small/fine pieces of jewellery such as chains, rings and earrings. 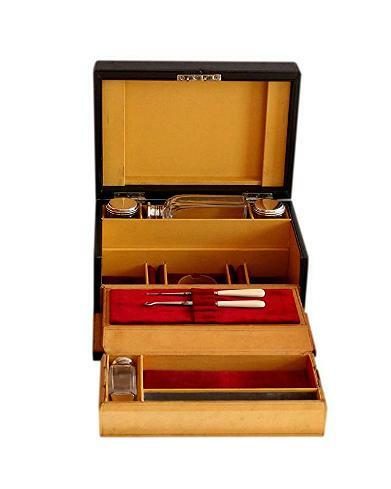 This fold out section has its original tan leather covering, and original metal handles. 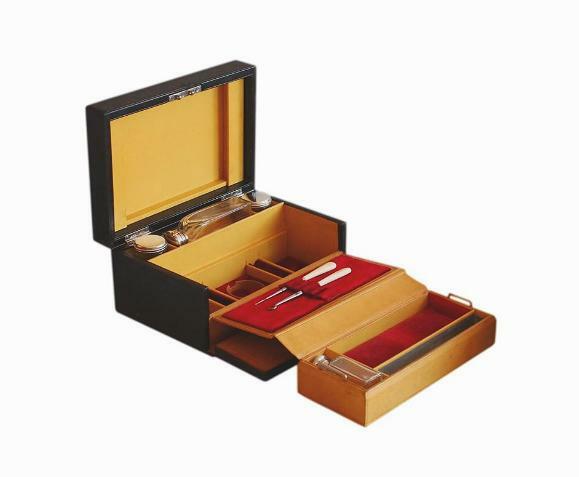 Beneath the fold out section is a further set of 3 compartments plus 2 ring storage sections. 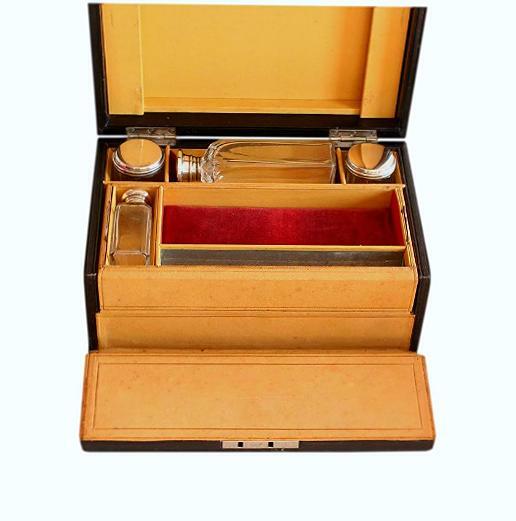 The centre compartments has a circular fitted ring which would've originally held a pocket watch. It would now be useful for holding a large brooch or locket, and a bracelet or narrow bangle would look lovely around it. 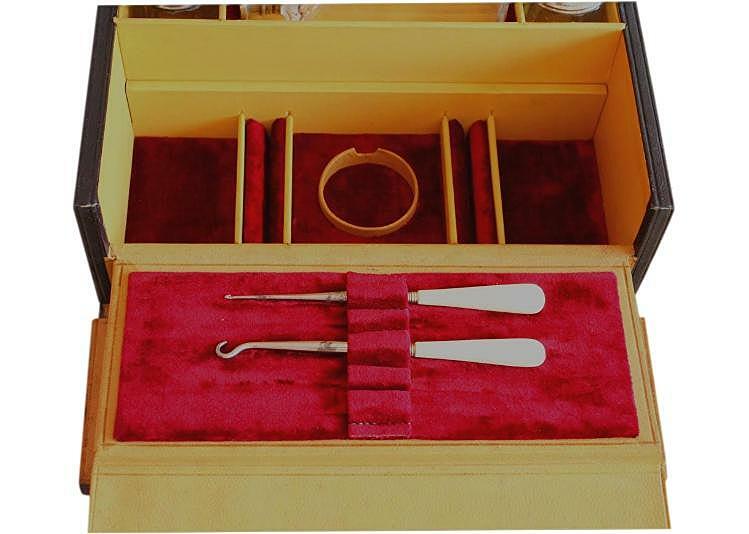 The left and right compartments will store further small pieces of jewellery, and the ring storage sections will each hold 3 to 4 rings. All of the compartments have their original red velvet panels and the ring storage sections also have their original matching red velvet coverings. The top rear section of the interior has 3 compartments. 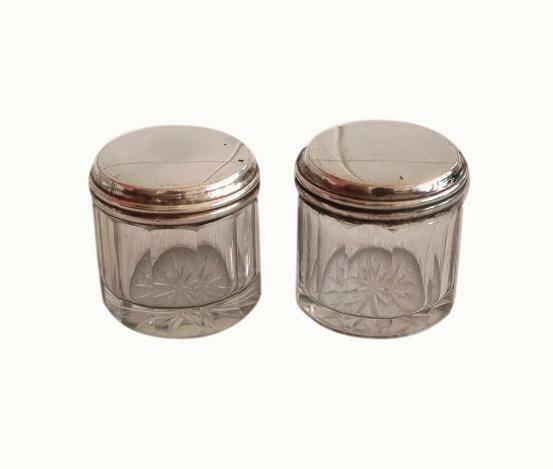 The left and right compartments are holding beautiful matching antique cut glass jars/pots with silver plated lids. These are possibly powder jars. 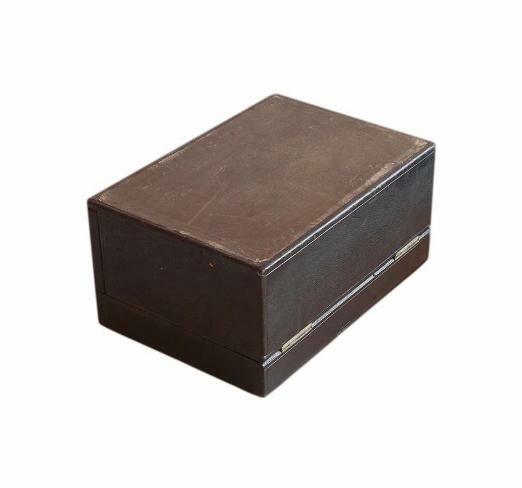 You could now use these for the storage of trinkets, talcum powder or small items such as cotton pellets etc. The centre compartment is holding a largish bottle with a silver plated lid. This is a matching larger version of the bottle in the fold out section. The inside of the lid has its original tan paper linings. This appears to have been designed to hold a mirror but there is no evidence of one ever being fitted. This wonderful box is in lovely condition for its age. The leather has some age related wear as we'd expect but nothing that's unsightly. The interior velvet is still lovely with no splits or fraying. The bottles and jars are in great condition with no chips or cracks. There is light tarnish to the lids. There is some friction wear to the vinyl on the bottom of the box. 17.0 by 6.0cm with a 1.8cm depth. 17.0 by 2.0cm with a 2.9cm depth. 7.2 by 5.0cm with a 1.8cm depth. 7.0cm square with a 1.8cm depth. 4.2cm diameter within circular ring.